Take the Gorman St. Exit, Exit 295 in Raleigh off of I-40/440. When travelling from I-40 East turn Left at the end of the Gorman St. Ramp putting you on Gorman St. going North. When travelling from I-40 West turn Right at the end of the Gorman St. Ramp putting you on Gorman St. going North. Travel North on Gorman St. for approximately 1.1 miles. Make a right at the stoplight onto Avent Ferry Rd. 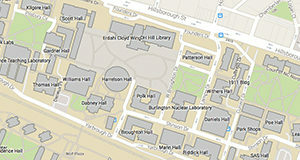 Make an IMMEDIATE left onto Faucette Dr.
Jordan Hall, Biltmore Hall, and Robertson Hall are all located on Faucette Dr. Parking on campus is very limited. Parking permits are necessary to park on all NC State campuses from 7 a.m. to 5 p.m., Monday through Friday. A parking pass is not needed during the weekend or after 5:00PM on weekdays. Several visitor parking pay lots are located within an easy walk of the CNR complex. The closest are the Dan Allen Deck and the Colliseum Deck. Campus visitors (including workshop, seminar attendees) are charged $5 per day to park on campus. Permits may be purchased at the Visitor Information Center as well as the NC State Transportation Office located at 2721 Sullivan Drive. The Transportation Customer Service area operates from 7 a.m. – 5 p.m., Monday through Friday. In some cases, the person or office you are visiting may be able to obtain your parking pass for you. You will need to make this arrangement in advance of your visit. Permitted parking is available in “C” permit spaces around the CNR buildings as long as a visitor permit is obtained. The permit must be clearly displayed on the rearview mirror of your vehicle. You may also wish to consider riding the Wolfline – our free campus bus system. During Fall and Spring semesters Wolfline serves two Park and Ride locations: Westgrove lot just north of Western Boulevard at Blue Ridge Road and Westgrove Street, and Carter-Finley Stadium. The Wolfline serves Main Campus, Vet School, Centennial Campus, E.S. King Village, Avent Ferry Road, Gorman Street and Fraternity Court. The eleven daytime routes (most extended until 10 p.m.) and evening (Werewolf) route operate frequently – depending on the time of day or evening. Wolfline operates on a modified schedule with reduced frequency during the summer. For more information about transportation and parking at NC State review the resource box at the top of this page and visit NC State Transportation Visitor Information. For other office locations please call 919.513.0152 for assistance.